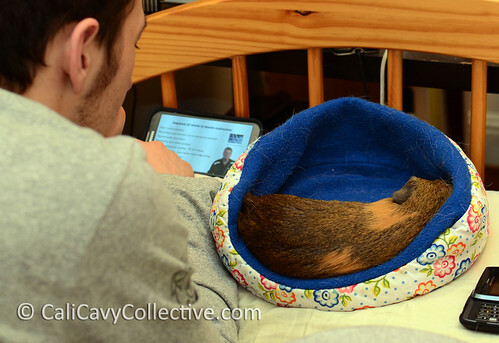 One of my favorite ways to spend a relaxing evening: with a cavy companion and something to read. The only downside is being rendered immobile when your lap pig falls asleep. The piggy dad was trapped in place after Belka dozed off partially braced against his arm. Shh.. don't disturb the sleeping peeg! Oh, most definitely never disturb a sleeping pig! They are just too cute to move :) What we do for our pigs! *Sigh*. Pigs. Our O' Faithful Masters!